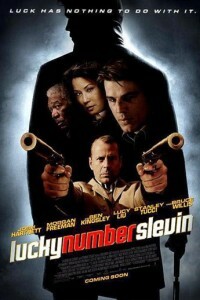 “Lucky Number Slevin” is a comic thriller that twists and turns its way through an underworld of crime and revenge where nothing is as it seems. Set in New York City, a case of mistaken identity lands Slevin (Josh Hartnett) into the middle of a war being plotted by two of the city’s most rival crime bosses; The Rabbi (Ben Kingsley) and The Boss (Morgan Freeman). Slevin is under constant surveillance by relentless Detective Brikowski (Stanley Tucci) as well as the infamous assassin Goodkat (Bruce Willis) and finds himself having to hatch his own ingenious plot to escape the maze alive. Two policemen see their personal and professional lives fall apart in the wake of the "Black Dahlia" murder investigation. .